Mix Lot of 10 Pieces Indian Tribal Kantha Quilts Vintage Cotton Bed Cover Throw. Hand-Stitched Old Sari 10 Artisan Handmade Reversible Indian Tribal Vintage Kantha Quilt Kantha Throw. ASSORTED "RANDOM COLORS & DESIGN" WITH SAME THEME WILL BE SEND AS PER AVAILABILITY IN STOCK. Size: Twin 52x80 Inches approx (132cm X 208cm). Room: Living Room, Bedroom, Children's Bedroom, Guest Room, Kid's Room. Wash Care: Wash delicately in cooled water or Dry. Design: You will get a assorted design. Country/ Region of Manufacture: India. Vintage Kantha Quilt is made up of 100% Cotton Material. It has three layers of old recycled sarees which is painstaking hand-stitched together with successive thousands of small & delicate fine running sturdily Kantha stitches, Hand-Stitched and Crafted softly quilted handmade by Artisans in India. Two good condition recycled sarees is placed on both side of quilt and small pieces of fabric are placed in between in such a way that its equally spread (Batting/Wadding/Filler) and makes a three layer quilt, some time if both side fabric are thick enough then we dont keep any middle stuff. Each Sari fabric has been washed before making the quilts and has not been used in its Kantha Throw form. The entire quilt is meticulous hand-stitched embroidered with end number of successive running stitches to create a unique product, one of a kind (No two are alike), thus its a perfect GIFT for any occasion. All these characteristics make them a Vintage Kantha Quilt. It is Rural Tradition of India to recycle used old sari for moulding quilts/throws. Kantha is still the extremely admired form of embroidery practiced by rural women in India. The Process in which the stitches have been done by hand, makes the quilt Eye-Catching. Vintage Kantha Quilt is 100% Organic & Eco-friendly. It has different alluring warm and attractive colors, designs and patterns on either side which gives a distinct look & thus can be used both sides (REVERSIBLE). Vintage Kantha quilts are well-known and appreciate due to their Kantha work. 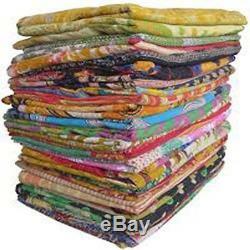 Vintage Kantha Quilts are very kid friendly and it is used in Baby Blanket as well. Kids actually love it with its color and cool pattern. Whether you drape it over your bed, couch, or favorite chair, its sure to make a statement and breathe new life into your decor. Bright colors add vibrancy to your living space / bedroom. It can be used in a variety of ways as quilt, blanket, bed cover, bed throw, bedspread, table cover, coverlet, curtains, wall hanging, tapestry, rug for picnics/beaches and carpet. Adequate Work of Kantha stitches it gives enough strength and durability for washing by hands and also it can be cold washed through washing machine. We are 100% assured that you will fondness to these beautiful Kantha quilts forever once you bought it, because these quilts are more beautiful in person. As these are made by old recycled sarees hence they may have some loose threads, open ends, small spots/stain and small patches (Patches from other colourful sarees), which is very rare since each item is handpicked and these things are not being considered as defects, as item is made of vintage material. This is a normal part of the work for 100% handmade quilt, which adds more beauty to its character, but there won't be any compromise in quality. However, we think you are more likely to be amazed by how perfect a handmade product can be and time taken to make this quilt. Note - Actual Images of items in indirect sunlight are shown above. Depending on the size of products there may be dimension variation because products are made by hand and also variation in weight due to moisture, dryness, gravity and different measuring machines. As this is vintage made up of old clothes (5-20 Yrs old) so rare stains or slight odour is expected. We think that's part of there charm and its uniqueness. The item "10 Artisan Handmade Reversible Vintage Kantha Quilt Indian Tribal Kantha Quilt" is in sale since Friday, April 21, 2017. This item is in the category "Home & Garden\Bedding\Quilts, Bedspreads & Coverlets". The seller is "maniona" and is located in JODHPUR, RAJASTHAN.